Skibbereen Rowing Club was formed in 1970 by founding members - Danny Murphy, Donie FitzGerald and Richard Hosford, to promote the sport of rowing in Skibbereen and its environs. The founder members purchased a four-oar rowing gig and competed at local regattas. There was, of course, no clubhouse so the boat was stored on the riverbank beside Deelish Pier. In 1971 the Club made the momentous decision to affiliate to the Irish Amateur Rowing Union and invested in a second-hand coxed four-oar outrigger rowing boat. 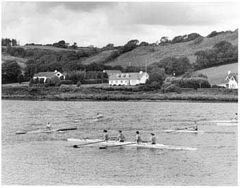 Thus Olympic Class rowing was introduced to Skibbereen and West Cork. 1973 saw the purchase of the Clubs first new outrigger boat and oars and the Club continued to row from its original Home at Deelish Pier until 1977 when the site of the current clubhouse was purchased. With the growth in the number of competing crews, the Club embarked on the building of its new club facilities, i.e. boathouse, squash courts, showers and changing rooms, club assembly area etc. This was a very ambitious project for a small club but its success has justified the faith and foresightedness of the committee at that time. The progress of the Club since then has been phenomenal, from the Clubs first International Representative at the 1975 World Rowing Championships and first National Championship Title in 1976 to two Silver Medals at the 2005 World Championships and the present tally of one hundred and forty six National Irish Championships. The development of Skibbereen Rowing Club into the major force that it is in Irish Rowing today is due to the vision and hard work of many people who still work tirelessly to maintain its many successes. The Club is managed by a Committee comprising of Chairperson, President, Treasurer, Secretary, PRO, Captain, Head Coach and coaching committee, as well as committee members. As a totally voluntary organisation, many fundraising events are organized throughout the year to provide the money necessary to fund the top class racing boats and training equipment demanded by top athletes as well as covering the day to day running costs of the Club. The Club caters for both male and female athletes, aged ten years and upwards and members compete at all levels from Olympic to ordinary domestic regattas. The Club prides itself on its record of coaching oarspeople from beginner level to World Class. The growth in the number of crews in training and in competition requires continuous updating and expansion of the clubs fleet of boats and equipment. This fleet outgrew the available boat storage space. Consequently the club opened a 3,600 square foot state of the art boathouse recently. This facility freed up the space necessary to expand the clubs gym facilities. The club has further plans to build a rowing tank and slipway, purchase a new boat trailer, safety launch and gym equipment and also to continue the renewal of its existing fleet of racing boats. The Club's 163 Irish National Rowing Championship wins places Skibbereen Rowing Club as the top club in Ireland. 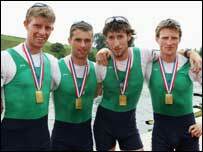 Club members have also contributed to very many Irish National Rowing Crews at International level over the years. The Club has contributed enormously to the rising standard of Rowing in Ireland, competing successfully with the best in both Europe and the World. The provision of top class equipment has enabled our athletes to compete at the highest level, ensuring maximum results for their commitment and dedication to training through the years.